How to create new folders and organize your surveys into customized folders. You may have created different surveys for different respondent groups which, if unorganized, will be littered all over the place. This could limit easy navigation and dilute your experience with the product. 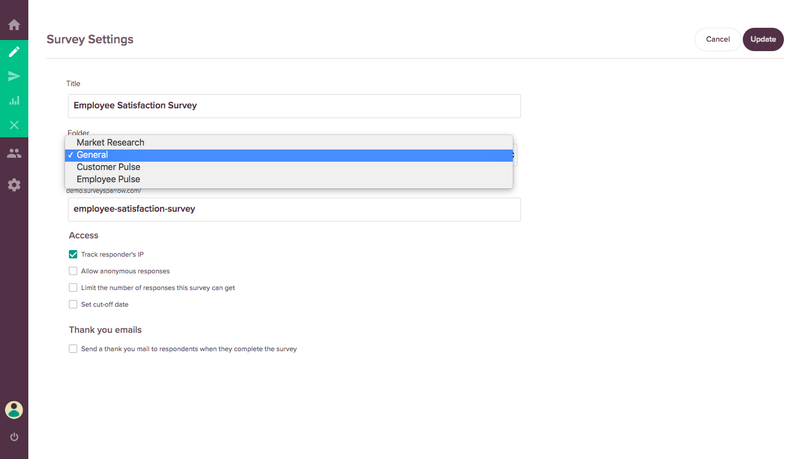 SurveySparrow lets you organize all your surveys by categorizing them into customized folders of your choice. Go to your SurveySparrow Home page. The home page always lists your entire surveys by default. You can organize them here. In the home page, click on the Folder icon denoted by + Add. 3. Type your desired folder name into the space provided and click on the check mark icon. You have saved the folder name and the new folder will now appear among your folder list. Note that every new survey is saved into the General folder by default. You can move them to a folder of your choice by going to Survey Settings and selecting the desired folder from the list.